Gross production of natural gas in the United States has generally been increasing for more than a decade and in recent months has been more than 10% higher compared with the same months in 2017. This growth has been driven by production in the Appalachian Basin in the Northeast, the Permian Basin in western Texas and New Mexico, and the Haynesville Shale in Texas and Louisiana. These three regions collectively accounted for less than 15% of total U.S. natural gas production as recently as in 2007, but now they account for nearly 50% of total production. Production in these regions has increased in part because of new drilling and completion techniques, including longer well laterals that have increased well productivity. By contrast, the Gulf of Mexico's share of total production, which was 12% in 2007, has fallen to just 3% in recent months, and the share of production in the rest of the United States has declined from 60% to 28%. Growth in natural gas production in the Northeast has come mainly from the Marcellus and Utica shale plays in the Appalachian basin, which collectively accounted for about 29% of total production in July 2018. Recent infrastructure buildout in the region has allowed natural gas to move out of the region and has reduced the prevailing discount to the national benchmark price at Henry Hub and to regional prices. 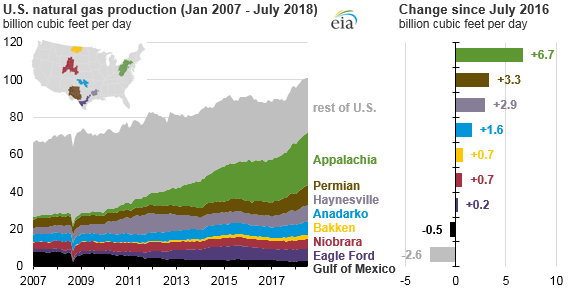 In contrast to the Appalachian, Permian, and Haynesville regions, the Gulf of Mexico has accounted for an increasingly smaller portion of national production, which is a significant change from a decade ago. Older wells in the Gulf tend to be more natural gas-rich, and newer wells tend to be more oil-rich. These factors contributed to the overall decline in that region's natural gas production. In addition, the technology and expertise required to produce oil and natural gas from the seabed is more expensive and specialized. Drilling platforms sometimes cost a billion dollars or more and take several years to construct. Finally, offshore projects generally carry higher risk than onshore projects.